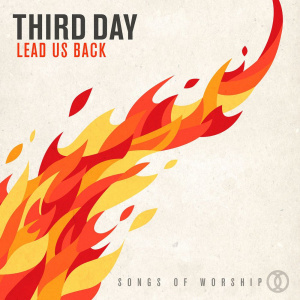 For the first time in more than a decade, Third Day will release a new worship album, titled Lead Us Back. The highly anticipated album is the third worship recording that the multi-Platinum rock band will have released since the group made their mark on the music industry in 1996 with their self-titled debut smash on Reunion Records, which was certified Gold by the RIAA. Says vocalist Mac Powell, "We've wanted to do a worship album for quite a while but have been waiting for the right time. NOW is that time! I believe this is the best batch of songs that we have ever recorded!" Bass player Tai Anderson adds, "'Lead Us Back' is a call to worship not just for our audience but the band as well. Why now? We're ready for these songs. We're ready to feel God's spirit fall afresh on all of us again." Third Day, comprised of members Mac Powell, Tai Anderson, David Carr and Mark Lee, during the last two decades, has racked up 30 No. 1 radio singles. The band has sold more than eight million albums, including two RIAA 2x Multi Platinum, five Platinum and 12 Gold certifications. A Georgia Music Hall of Fame inductee (2009), Third Day has garnered four GRAMMY Awards (with 11 career nominations), an American Music Award (with four American Music Award nominations), multiple ASCAP honors (including its coveted Vanguard Award for songwriting), and 24 career GMA Dove Awards (from 42 nominations). Long known as Christian music's premier live band, the Atlanta-based Third Day has performed for audiences reaching into the millions all around the world. The group has been featured on "The Tonight Show," "The Late Late Show with Craig Ferguson," "60 Minutes," ABC's "Nightline," and written about in USA Today, the New York Times and Billboard magazine - a cover story which called Third Day "one of the best rock bands, period." Lead Us Back:Songs of Worship by Third Day was published by Essential Records in March 2015 and is our 17140th best seller. The ISBN for Lead Us Back:Songs of Worship is 083061102524. Be the first to review Lead Us Back:Songs of Worship! Got a question? No problem! Just click here to ask us about Lead Us Back:Songs of Worship.